The server is presented in a limited edition wooden box that features a rose wood finish along with a blue felt interior and brass colored metal hinges and latches. Please note that these boxes may have minor inclusions in the wood that are not consider defects. 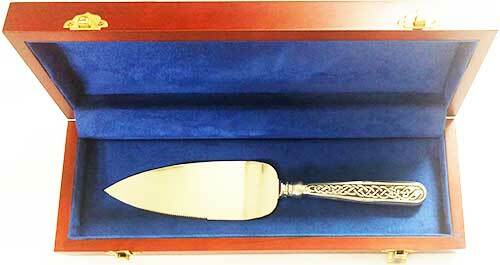 This Celtic cake server features a pewter handle with embossed knot-work and it would complement any Irish wedding celebration.